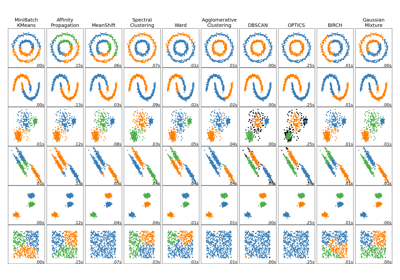 Perform Affinity Propagation Clustering of data. Damping factor (between 0.5 and 1) is the extent to which the current value is maintained relative to incoming values (weighted 1 - damping). This in order to avoid numerical oscillations when updating these values (messages). Make a copy of input data. Preferences for each point - points with larger values of preferences are more likely to be chosen as exemplars. The number of exemplars, ie of clusters, is influenced by the input preferences value. If the preferences are not passed as arguments, they will be set to the median of the input similarities. Which affinity to use. At the moment precomputed and euclidean are supported. euclidean uses the negative squared euclidean distance between points. 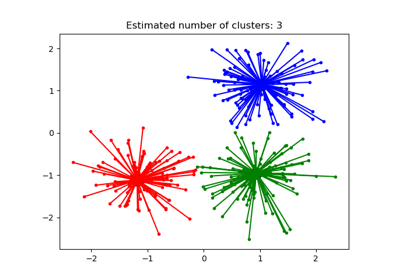 Cluster centers (if affinity != precomputed). Stores the affinity matrix used in fit. Number of iterations taken to converge. The algorithmic complexity of affinity propagation is quadratic in the number of points. When fit does not converge, cluster_centers_ becomes an empty array and all training samples will be labelled as -1. In addition, predict will then label every sample as -1. When all training samples have equal similarities and equal preferences, the assignment of cluster centers and labels depends on the preference. If the preference is smaller than the similarities, fit will result in a single cluster center and label 0 for every sample. Otherwise, every training sample becomes its own cluster center and is assigned a unique label. fit(self, X[, y]) Create affinity matrix from negative euclidean distances, then apply affinity propagation clustering. Create affinity matrix from negative euclidean distances, then apply affinity propagation clustering. Data matrix or, if affinity is precomputed, matrix of similarities / affinities.